Standard Base with Extensions- for athletes weighing between 50-70 lbs. for ADVANCED skills. Standard Base with Extension & plywood (purchased from a local home improvement store)- for athletes weighing up to 125 lbs. The 48” space between the base permits a standard 4 ft. wide mat to be used underneath. 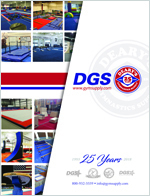 We recommend the 4'x8' Tumbling Mat with a Jr. Practice Mat on top. Recommended ceiling height 8-10', depending on skill. SPECIFICATIONS: 48” x 48,” bar adjusts from 38” high to an unequaled 59” high. PARENT TIP: This bar will grow with your child. 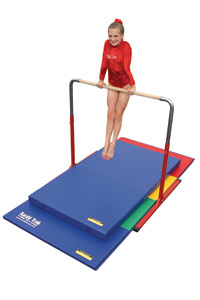 The standard bar is great for that 4 year old who is hanging on it and playing all the time. Use the extensions and it works wonders for the 10 year old who is learning casting, kipping, and basic circling skills.